Despite the above picture, this post is really all about pastry. Sweet, shortcrust pastry. Some time ago *waves hand vaguely* I introduced you to an all-butter pastry which I had adapted from an old Victorian commercial baker’s book. The crust for my Cheese and Potato Pies has about 25% cornflour, which makes it fantastically silky-smooth to handle and which also bakes beautifully crisp and dry. The recipe this week is for a sweet version, also from the same baking handbook: slightly different flour/butter proportions and enriched with the yolk of an egg, it is both more crisp and more delicate than the savoury version and a perfect foil for the three sweet fillings I’ve lined up for you, because I thought it rather a cheek to give you just a pastry recipe this week and let you get on with it. Plus I couldn’t get a lump of pastry to look tempting all by itself, so here we are. The fillings are very much variations on a theme of dark muscovado sugar and I’m really pleased with the three differing flavours that resulted. The Butterscotch is really dark and very much a ‘grown-up’ flavour – you could even add a slosh of real scotch to ramp it up to dinner-party level. 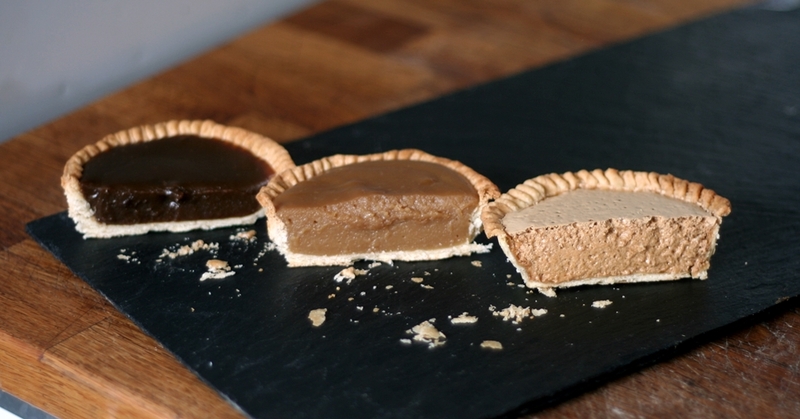 The Toffee is very child-friendly in flavour – almost mild – and a real comfort food. The Gypsy Tart is a 2-ingredient classic that harks back to memories of school dinners. There are many recipes for the filling ‘out there’, most of which generally have too high a proportion of sugar and too much milk, resulting in gigantic pies of tooth-aching sweetness. This version makes for a light and frothy filling with just the right balance of flavour and sweetness. It is the only one of the three that needs any further cooking once poured into the pre-baked pastry shell, but at just 20 minutes in a cool oven, these too are ready in a flash. I’ve left all three unadorned, but you could add embellishment if you like – unsweetened whipped cream or creme fraiche rather than more sweetness in a chantilly or buttercream, is my recommendation. A smattering of chocolate sprinkles for the toffee tart, perhaps? Your call. This quantity makes enough for one large tart or 4-8 individual tarts. Put the flours, butter, sugar and yolk into the bowl of a food processor and blitz until the mixture resembles breadcrumbs. Tip the mixture onto a floured surface, knead smooth then wrap in clingfilm and chill for at least 30 minutes. Roll out thinly and line your greased tart tin. If making smaller tarts, cut the pastry into 4 and roll out individually. Leave the excess pastry hanging over the side of the tin/s and chill in the fridge for another 30 minutes. The pastry will shrink as it chills and then you can trim the excess. If you trim it first, the pastry will shrink down inside your tart cases, probably unevenly, and your pastry cases won’t have a nice finish. Prick the bottom of the tart/s with a fork to prevent blistering, line with baking parchment and fill with beans/rice/beads. Bake for 10 minutes for small tarts, 12-14 minutes for a large tart. Remove the parchment and beans and bake for a further 3 minutes for small tarts, 5-8 minutes for a large tart, until fully baked. Melt the butter and sugar in a pan, stirring. Make a paste of the flour with a little of the milk, then stir in the rest of the milk. Pour this milk mixture into the butter mixture and whisk vigorously. Continue whisking until the mixture comes to the boil. Simmer for 2-3 minutes, stirring, to ‘cook out’ the taste of the flour. The mixture will thicken. Remove from the heat. Add a little extra milk – or scotch! – if it seems too thick, then pour into the bake pastry case/s and allow to cool. Warm the golden syrup before measuring it out, it will be much easier to pour accurately. Melt the butter in a pan and add the flour. Whisk until frothed and starting to darken. Warm the milk and sugar together and pour into the butter mixture, whisking briskly. Keep stirring over the heat until the mixture thickens, then remove from the heat and stir in the golden syrup. If the mixture seems too thick, add a little extra milk to loosen it. When you’re happy with the consistency, pour into the pastry shells and set aside to cool. Scatter over the chocolate sprinkles, if using, before serving. Chill the tin of evaporated milk in the fridge overnight. Do not skip this step. It will not whip up to its frothy perfection unless the milk is thoroughly chilled. Get rid of all the lumps in the sugar by pounding it in a pestle and mortar. Work a little at a time rather than trying to get the whole batch lump-free in one go. It’ll give you something to do while the milk chills. Put the sugar and the chilled milk into a bowl and whisk for AT LEAST ten minutes. You want the sugar to dissolve and the milk to increase in volume and become light and frothy, like half-whipped double cream. You can test whether the sugar is fully dissolved by rubbing a little of the mixture between finger and thumb – it should not feel grainy at all. If you have a stand mixer and a balloon whisk attachment, this might take a little less time, but not much. Pour your mousse-like mixture into your pre-baked pastry case/s. It will not rise much in baking, so you can fill them pretty full. Bake for 20 minutes or until the filling has set: no wobble when gently shaken. They all look great, but I think I’d go for the Butterscotch! Do love a tart, retro especially! Butterscotch is always a winner but they all look good. 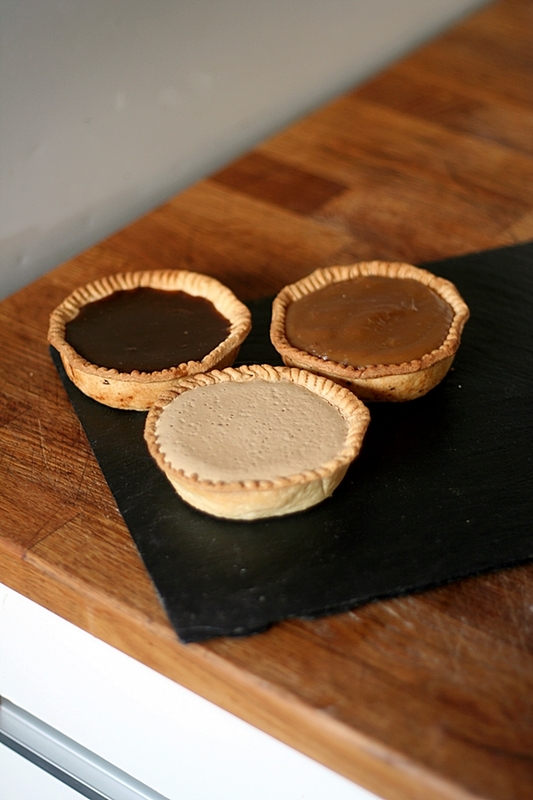 What about a salted caramel filling – I know it’s very trendy but I love the combo? The butterscotch & toffee were delicious (how could they not be?) but where oh where has the gypsy tart been my whole life? The first candy my brother and I were allowed to make on our own was penuche, and this is just a creamier version of that childhood treat. Thanks for a new simple treat to keep in my back pocket when something sweet is needed. OH! In the rare chance someone has a few left over? I found something that takes amazing to almost nirvana – I don’t know if the UK has something close to our ‘Concretes’ (milkshakes that are rendered into spoon only, no straw consumed treats by adding cookies, bits of cake, candy or pastry into the mix) but I tossed two broken tarts into the blender with some raspberry sorbet and ended up with a glorious mess. A friend had similar success with a few spoonfuls of dark chocolate icecream and the butterscotch tarts. Toe-curlingly tasty! You’ve been in my thoughts – and I hope everything with you is good. Thanks Mary-Anne! Only slowly been able to get back to the computer – let alone getting into the kitchen. I must have been temporarily insane to agree to buy a new home before selling both our old house and my mother in law’s. Between getting us moved, HER moved in with us (my husband can never doubt I love him. Not only did I marry him after meeting her… I then let her move in. I seem to have a history of choices made during whirlwinds of insanity.) and now try to get the other houses sold it’s all been a bit hectic. Even after 6 months we seem to be partially buried in boxes. Thankfully our house has been rent out, but next month we tackle 50 YEARS of accumulated crap clearing out her old place… um. If you happen to have any recipes you want to post covering quick meals, packed lunches and/or drinks with staggeringly high alcohol content I’d be grateful. At this point I would be happy to find a few jugs of Nanny’s Scumble. The thing keeping me moving? The new house is AMAZING. Floor to ceiling bookshelves in almost every room, 2 full kitchens, we’re in the process of building a 3rd outside (will have the grill, a smoker, an outdoor fridge, eating area and I’m building a brick & clay oven for homemade bread, pizza and roasting pans full of goodies.) 3 bathrooms, 2 sun-porches, a green house and best of all… I now have my studio space. A whole separate building, above the workshop my husband has his forge. The studio will get a bathroom plumbed in this fall and it can then be used also as a guest house when needed. Going to be another 6 months before the dust settles, I fear, but totally worth it in the end. I’m just happy it’s finally at the point I can start cooking regularly again – sick to the teeth of all the protein shakes I’ve been living on.